I couldn’t find boots that were exactly like the ones I picture Victorine wearing in Paris Red, so I bought these teal suede ones. In the novel, Victorine gets her green boots from one of the prostitutes her mother sews for. She’s still a girl when she receives the gift, but she keeps the boots and grows into them. I bought my boots on eBay. 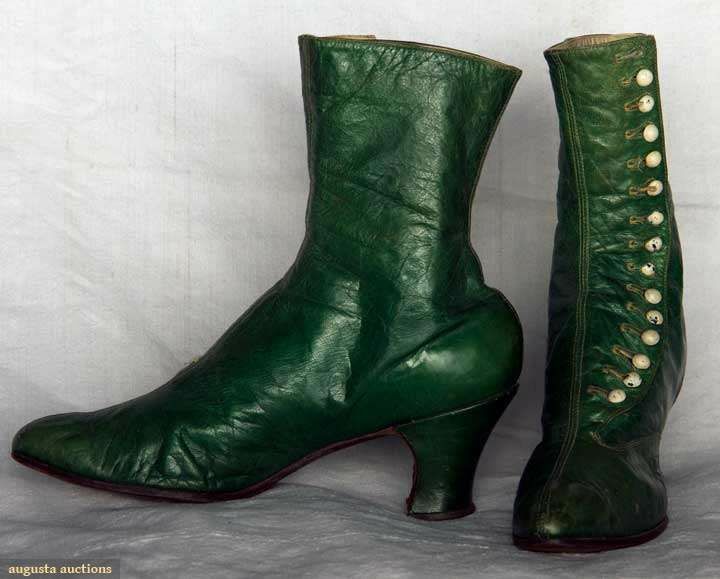 August Auctions states that these emerald green boots are from the 1890s, so they aren’t the right era for Paris Red, but they are the right color. According to what I learned from the blog of American Duchess, I think Victorine’s boots would have had lower “opera” heels with no curve at the “breast” of the shoe, or the area under the arch. If I decide I want to buy a more accurate replica of Victorine’s boots, I can find them here on the same blog!